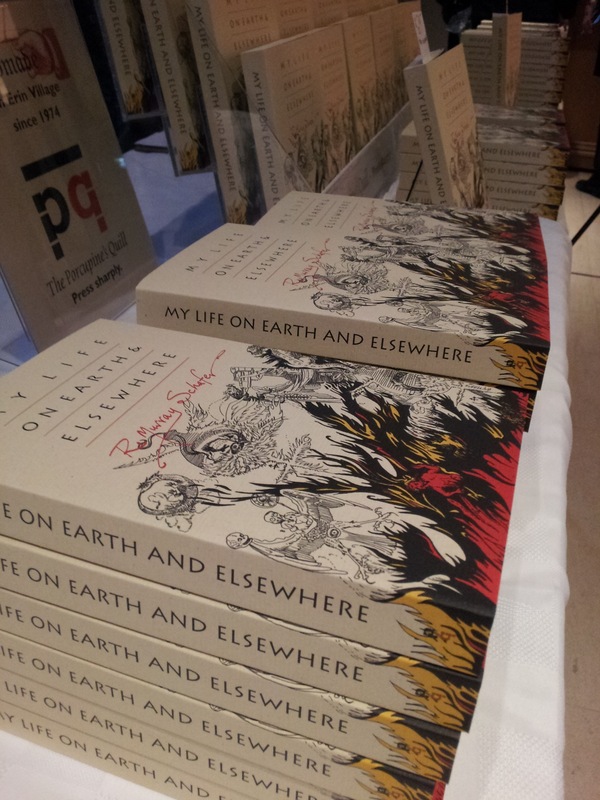 It was overcast when I drove downtown last Sunday for the launch of My Life on Earth and Elsewhere at Koerner Hall. I knew it would rain sometime over the course of the evening, because it had been raining on and off all weekend—a drizzling spitting sort of rain I had experienced first hand just the day before as I was loading books into my car at the end of the Down in the Bottom of the Bottom of the Box launch. But this time I was prepared. This time I had an umbrella. This time I was ready for anything. This month the Porcupine’s Quill published My Life on Earth and Elsewhere by R Murray Schafer. The book spans Schafer’s life, starting in his very early days and following him through his development into one of Canada’s most important composers. Schafer is well known for his cheekiness, and My Life on Earth and Elsewhere is full of Schafer’s delightful wit and mischievous irreverence. As much as the book is about Schafer, it is also about Schafer’s milieu. It paints a fascinating picture of music and culture in Canada in the later half of the twentieth century. My Life on Earth and Elsewhere had been scheduled for publication last season, but production was delayed when PQL received an offer it couldn’t refuse from Esprit Orchestra. Now entering its 30th year, Esprit planned to kick off its 30th anniversary season with The Turning of the World, a concert and a celebration for which they commissioned a new piece by R Murray Schafer. What better way to celebrate the world premiere of Schafer’s Wolf Returns then to simultaneously celebrate the publication of his autobiography? The pairing was a no brainer. And that is how I ended up driving downtown this past Sunday afternoon in my finery, my trunk full of books and display materials, heavy clouds looming overhead, on my way to Koerner Hall. Koerner Hall is the newest addition to The Royal Conservatory on Bloor Street. Founded in 1886, the conservatory was formed in order to offer a graded curriculum for the study of music. The school moved to College Street in 1897 and then to McMaster Hall on Bloor Street in 1963—where it remains today. The plans to expand the building with the addition of a new concert venue were begun in 2004 with the assistance of the TELUS Corporation. Koerner Hall was completed in 2009. It stands today tucked in behind the beautiful Victorian facade of McMaster Hall. Great care must have been taken by the architects who designed the new building, for the finished product serves as one of those rare examples of old and new architecture working together splendidly. (The only other effective combination of old and new styles I can think of is the cathedral in Norwich.) Rather than the new building obstructing or otherwise disrespecting the old, at The Royal Conservatory, the new has great admiration for the old and the old gracefully accepts the necessity of the new. It is truly a lovely combination. As I walked up the steps into Koerner Hall, those great grey clouds threatening overhead, I admired the architecture around me. High ceilings arched over my head, making me feel rather small as I walked the long atrium behind McMaster Hall. The intricate stonework of the old hall loomed above me. You see, Koerner Hall wraps round the back of McMaster Hall, and, though the buildings touch, the beautiful stonework of the old hall has been perfectly preserved. The glass exterior of Koerner Hall hugs the bricks, but never mars it. It is almost as if the beauty of the old building has been put on display, its value heightened by the respect of the unassuming glass exterior of its new companion. At the end of the long walk past the back of McMaster Hall was to be our book table. Marc Glassman of TINARS arrived with us, and it was together that we made up our tables and ripped open box after box after box of books. Soon the tables were filled with My Life on Earth and Elsewheres. All we needed now were some bookbuyers…. Events at Koerner Hall got underway at 7 o’clock with an interview of Schafer in the lobby, conducted by fellow composer Alexina Louie. It was at this time that the bar started to open the complimentary bottles of Chardonnay. As a crowd gathered around Schafer, the sky began to darken into twilight outside. The discussion moved into the concert hall at 7:20pm, where guests could come and listen to Schafer speak in a more formal context. By 8 o’clock we were all in our seats, waiting for the concert to begin. Having never attended an Esprit concert before, this concert definitely challenged my preconceptions of classical music. When Esprit was formed 30 years ago, its mandate was to perform only new, challenging Canadian music. The trouble is, of course, when you think of an orchestra, you think of old music, don’t you? Bach. Vivaldi. Mozart. Those guys. What Esprit preformed Sunday night was music I had never heard before—I hadn’t even known music like that existed. Most delightful (but of course, I am biased) was Wolf Returns by R Murray Schafer himself. In it, Schafer combines a modern orchestral score with … chanting. The latter came as a surprise as, early on in the piece, deep sounds started to fill the auditorium. But where were they coming from? I could see members of the audience turning in their seats, straining their necks, searching for the source of the low rumble of human voices. Hidden in the third balcony was a troupe of chanters, and they entered into musical discourse with the orchestra below. It was a most wonderful piece of music, filling the entire hall with life. There was even a fly written into the score … but I’ll let you discover that little joke on your own. My Life on Earth and Elsewhere on display at Koerner Hall. As we filed out of the auditorium after the performance, I headed over to the book table. The orchestra may have finished for the night, but PQL’s work had only just begun. A crowd began to form around the table as devout fans jostled for a place in line to have their books signed by Schafer. Outside, it had begun to rainy lightly. A publisher’s work is never done! This entry was posted in Letters from the Porcupette (the Intern's Blog) and tagged book launches, Koerner Hall, My Life on Earth and Elsewhere, R Murray Schafer. Bookmark the permalink.